Who knew that gecko feet inspired scientists to develop a stickier adhesive or that cockleburs in dog fur led to the invention of Velcro? Discovery Engineering in Physical Science uses these and other surprising cases of innovations sparked by accidental observations to teach about the amazing role of serendipity in science. 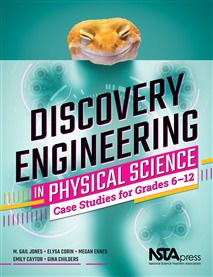 The case studies in this new resource are a lively way to integrate engineering into your physical science classes. Middle and high school students will learn to understand fundamental science processes while trying out their own ideas for unexpected applications.